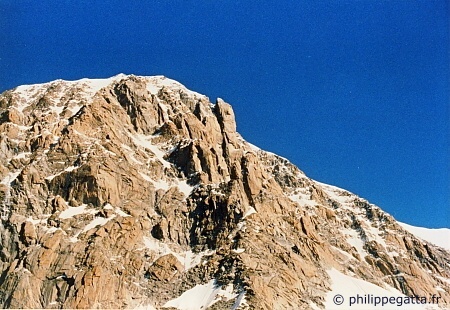 The central Pillar of Frêney of Mont Blanc is a fantastic and committed route. 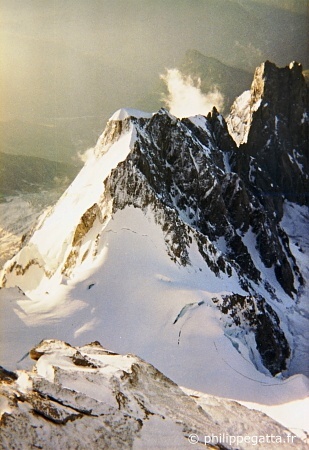 Walter Bonatti, Andrea Oggioni, Pierre Mazeau, Roberto Gallieni, Robert Guillaume, Pierre Kohlman and Antoine Vieille tried to make the first ascent in July 1961 which ended in tragic way with the death of 4 of them. 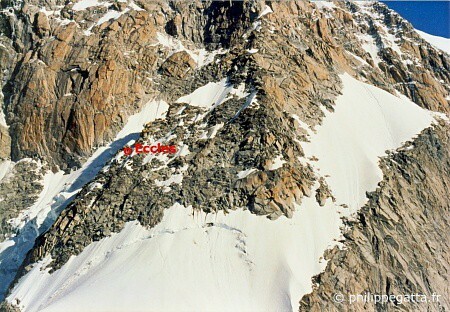 The first successful ascent was made by C. Bonington, I. Glough, J. Duglosz and D. Whillans, 27-29 August 1961, and R. Desmaison, P. Julien, I. Piussi, Y. Pollet-Villard 28-29 August 1961. 3am, I leave the car toward the Eccles hut. 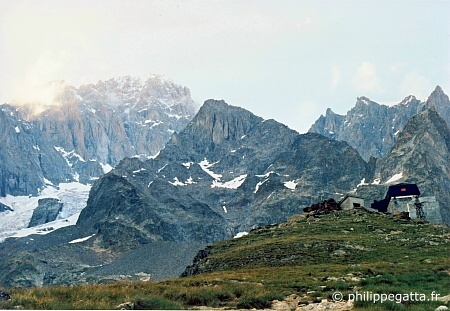 The sun already shines when I reach the Monzino hut, the trail is followed by the glacier of Brouillard (fog). It is cold but at least the massif seems “frozen” and no rock fall can be heard. 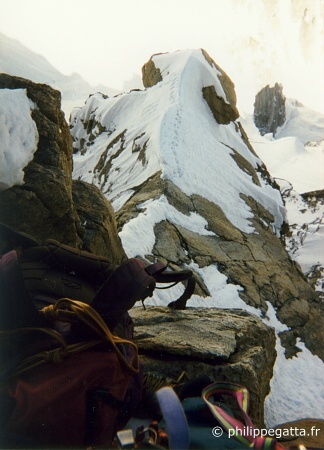 I climb to small steps below the Aiguille Innominata to avoid the crevasses. I reach the Eccles hut at 10:30am. There is lots of snow there. (+2300 m of total ascent). 2:45am. I left the Eccles hut. 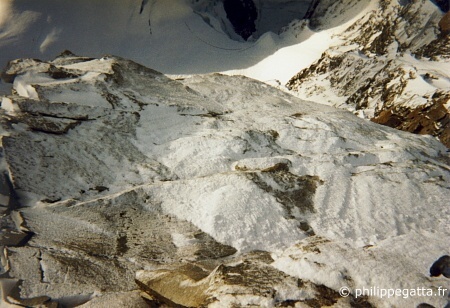 I join the upper part of the glacier of Brouillard toward the Col Eccles. 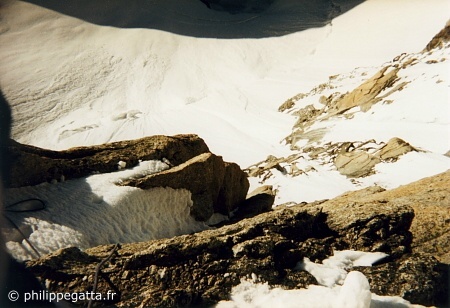 The Frêney side of the pass has a lot of snow and I can climb down without abseiling. I traverse right above a long rimaye and I reach the bottom of the route, at the base of two obvious dihedral in two hours. Pitch #1 and #2: I never found the "lame détachée" described in the book but there are several options to join the shelf of the second pitch (right of the dihedral). These 2 pitches had a lot of snow. Nice pitch with a crack and dihedral (35m IV, V), some pitons, friends useful. Two pitches not so obvious. Anyway they join the top of the second step. 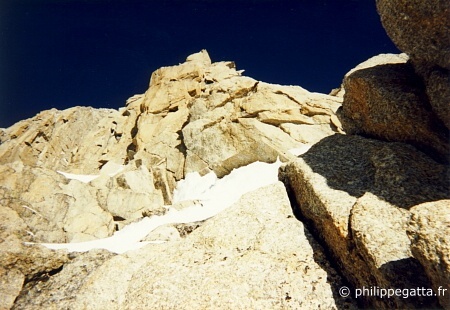 Nice view over the Innominata ridge on the left and the Grand Pilier d'Angle and Peuterey on the right. Lot of ice covered by 10/20cm of soft snow. I'm still using the crampons and ice axes. 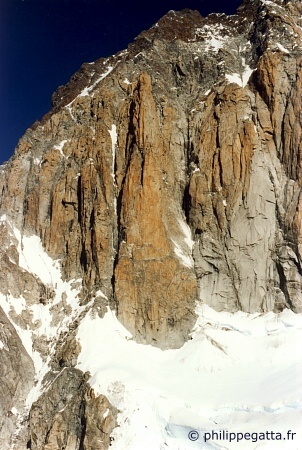 Tough section at the end of the 4th pitch, just before going to the right: small roof to reach snowy slabs. 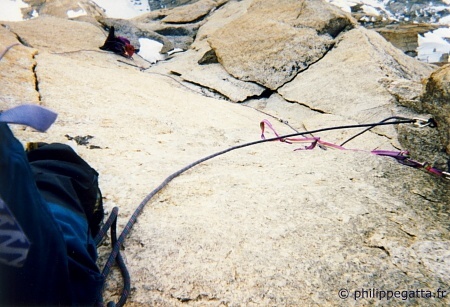 Great pitch (cannelures and slabs, IV/IV+). The rock was finally dry and I could use the rock shoes. 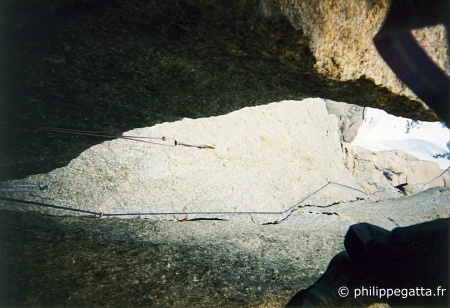 I free solo climb but the rucksack got stuck when I tried to pull it. So I had to abseil anyway and jumar the pitch up. 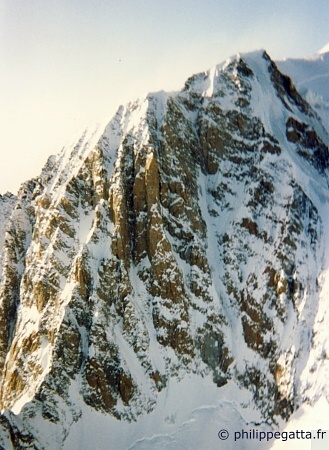 Physical pitch; dihedral with a small overhang (V/V+). Almost dry except underneath the overhang where the crack was filled up with ice. 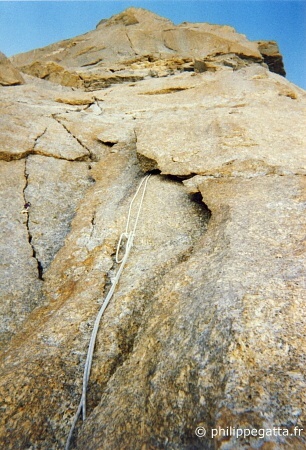 Crack / chimney (IV), nice technical climbing. 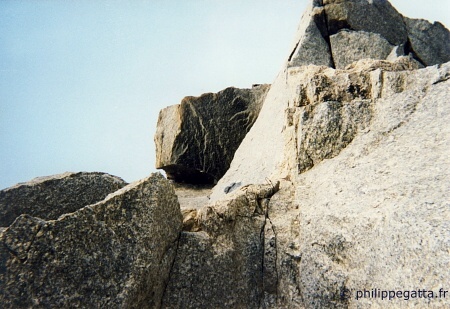 Dry pitch that I climb in free solo. Unfortunately the hauling rope got stuck, one more abseil and jumar. Snowy gully, mix, steep and not pleasant. 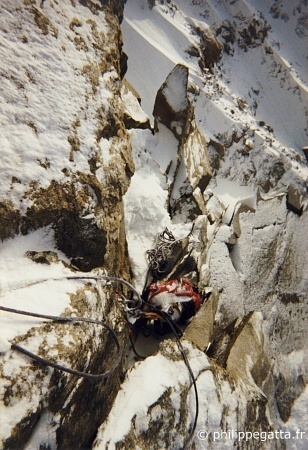 First pitch of the Candle, short crack (V), several pitons. The only spot for a bivy (80 cm x 120 cm). 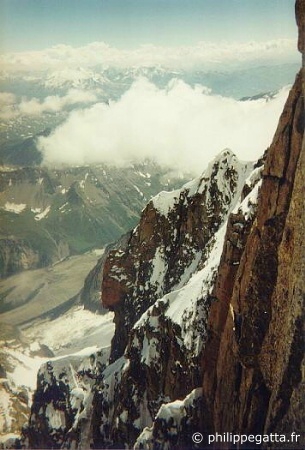 Great view over the grand couloir of Frêney. On now on, the rock was dry, compact and nice. 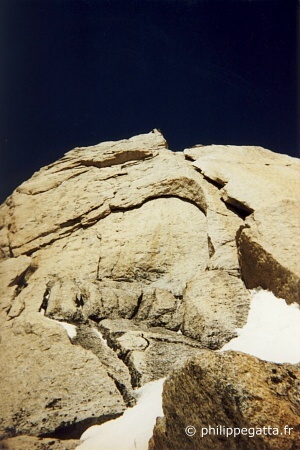 Horizontal traverse to the right under the overhangs (A1). Enjoy this place… With all the pitons and stuff jammed in the crack, the aid climbing is easy. I made an additional anchor at the end of the traverse which seems more logical to me. 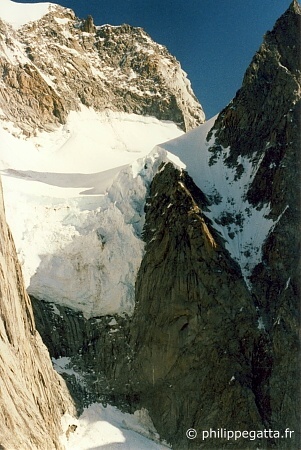 Last pitch, a 30 m pitch leading to the summit (IV). It is 11:30pm, 4500 m. I started the climb 20 hours ago. It is almost dark, it is snowing and the thunderstorm has just started (not forecasted). The 10 first meters of the slab are almost dry the end is snow covered and I can see if there are any pitons. I climb with the head torch. I reach a small shelf (40 cm x 80 cm). I use one friend and one nuts as anchor. The rope is jammed again so I have to go down again. Finally I am ready for this uncomfortable bivouac, seated on the rope, the legs inside the rucksack. 11pm. I just ate my pasta cooked with cold water which I used for a tea, great dinner… It is now snowing with some small hail and thunderstorm from time to time. I try to sleep 5 or 6 hours, seated on this small shelf without moving too much. 6am I am a bit cold. 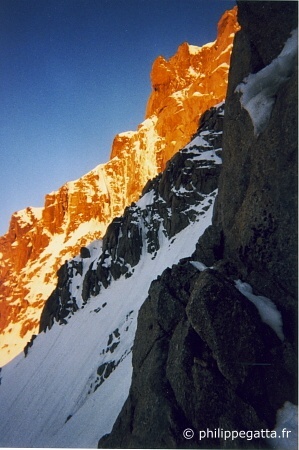 The Pillar is white, covered by the snow. It fell 10/15 cm of fresh snow. It took me an hour to climb the last pitch with crampon and ice axe on the slab. I had to break the cornice on the top of the Candle and abseil the 15 m. Above the slope is quite steep for 60 meters then there are 140m less steep till the Brouillard ridge then to the Mont Blanc de Courmayeur, the col Major and finally the Mont Blanc. After I descended the Aiguilles Grises for 3300 meters to the Val Veny. Ropes 60m in 9.4mm and 30m in 8mm, crampons, 2 technical ice axes, plastic boots, rock shoes, gri-gri, Croll, 8 strings, 9 quickdraws, 7 nuts, 2 Excentrics, 4 Friends, 1 quick link, 4 carabineers w/ screw gate, 1 hook , 1 knife, stove, gas.